“Savitri Amavasya” or “Savitri Brata” is an important vow that married women in Odisha practice by observing fast for their husband and wishing for their long life. Observed on the ‘Amavasya’ (last day of the dark fortnight) in the month of ‘Jyestha’, the day is considered very auspicious and the fast is observed by every married women in Orissa. Married women in Orissa fast during the day and listen to the story of Savitri and Satyabana. The fasting is dedicated to Savitri and Satyavana her husband who was destined to die within one year but was brought back to life by her severe penance. How is the Savitri Brata observed? Women get up early, have their bath and wear new clothes. They put new bangles and apply vermillion on their forehead and start arrangements for the worship. 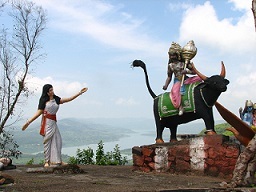 Savitri is symbolically represented by the grinding stone, locally known as Sila Pua. The grinding stone is thoroughly cleaned and decorated with haldi (Turmeric), Sindoor (Vermillion), new saree and gold ornaments. The women then listen to the legends of Savitri and Satyaban that is recited by the priest. Then they offer various types of fruits as ‘prasad’. All day long, the women only take fruits and observe fasting and keep praying to the Goddess for the longevity for their husband. The grinding stone used in the house is wrapped in a fresh cloth after washing with scented holy water and offered only ripe mangoes, coconut, palm, banana, pineapple in prayer along with a branch of the banyan tree.